Education hasn’t kept up with development in Big Data according to Deng. Good questions. But education alone may not be answer. How about moving some of the data(base) experts and content analysis experts into this field? The problem in solely focusing on teaching this stuff is that students do not have enough context about industry needs. While educational institutions teach theory, there is very little industry alignment or effort to understand industry needs. This problem cannot be solved in isolation. It has to be part of a bigger picture and spending a year or so in doing a variety of projects helping the industry. 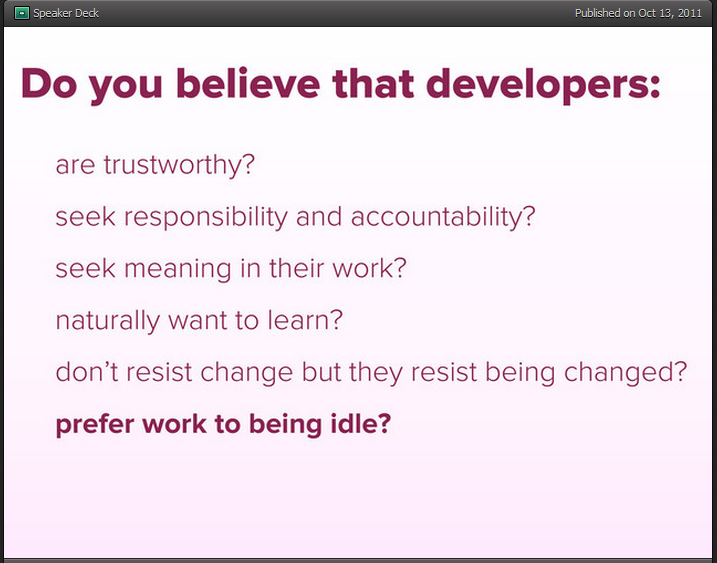 Do You Believe That Developers Prefer Work to Being Idle? Some times, a blog is not paragraphs of text. It is just one beautiful idea or a philosophy, you resonate with. When you see something this good, you want to share it and know what others think. Great thoughts by Scott Chacon on Handy Tools for Optimizing Your Team. I don’t think it applies just to developers. This may be the assumptions with which we want to welcome any new member into a team, community or organization. We can assume that they have these qualities unless proven wrong. I have a confession to make. This is not how I always looked at people. It took me a long time to figure out even some of the basic ideas of how to work with people. In one of my Infostreams alerts, there was an entry for a Librarian job. Out of curiosity I clicked on the link and was surprised to see these job skill requirements (partial) for a Digial Asset’s Librarian. knowledge of emerging trends in scholarly communications and library and information technologies. Text/Data manipulation, scripting and meta data – are these the new skills needed in science, engineering and knowledge work? What Does It Take to Build a Product Eco-system in the Technology Space? What does it take to build an ecosystem that fosters product development in the technology space? This question came up in our Chennai Open Coffee Club meeting in Jan.
You need an entrepreneurial spirit. These are people who are willing to risk their careers on building some thing to solve a pressing problem. They should be willing to give up short term gains to pursue their dreams. You need a culture that reacts to failure well. This will take time to build. It will help to have a few successful entrepreneurs who did well. That is happening very slowly. It will also help to have people who have done well in their careers and are willing to try something new. It needs a community. Communities are starting in Chennai – TiE Chennai Startup SIG, Nasscom Emerge, Chennai Open Coffee Club, Chennai Geeks and several other tech groups. It requires great educational institutions. I don’t think we have enough. Our Universities have to turn into research engines. There are a handful of institutions that do this a bit. Not enough, though. We need to have proximity to great people who have built products. That is beginning to happen. We need a spirit of collaboration. That is beginning to happen too. We need capital infrastructure. This includes angel investors, venture capitalists, financial institutions and other supporting services. What we have now is nowhere near what we need. We have the first generation of incubators. They provide space and infrastructure but not what entrepreneurs really need – guidance in building a business from customer validation to business development. There are a few experiments happening and hopefully their success will inspire others. A knowledge of the market would help. It is beginning to happen thanks to the Web. We need lots and lots of conversations on both successes and failures. This is beginning to happen. We need the spirit of bootstrapping. Out of necessity (due to the lack of funding sources), this is probably going to be the default model of building a business. We have good experience in building service companies. How can we leverage this to move into products? We have to find something unique and stuff that matters. This is much harder to come up with but not impossible. There are encouraging signs. More and more product companies are showing up at the annual Nasscom product conclave every year. Incubators have a chance to play the role of catalysts. I think there is an opportunity here to find some unique problems and solve them. This is an amazing view. I kept saying ‘No’ while I was listening to Mark Pagel but some how it seemed very convincing. I have difficulty in accepting this view. Not sure why, for I cannot argue against this possibility. Infiintely Stupidity? is a video worth watching. This half an hour journey is guaranteed to stimulate you and make you think. and, even for students who succeeded, the overall level of achievement was too low. new material, too fast, and I would spend the rest of the semester picking up the pieces. • Keep it short. It is better for students to read 10 pages than not read 50 pages. into a series of small steps. useful subset of Java and left out the rest. Focus on programming, not the programming language. That is it. That may be the magic formula. But I would add a couple more. Start with some really interesting, engaging problems. It is more difficult than it looks. I like how Moran starts out teaching Java in his Stanford Course. “Interesting and Engaging” can be different for different people. For me, it is a tug of war between insulting the intelligence of my students (by being too basic and boring the good ones) and being too obscure to start with. Just a way of thinking aloud – Think along with me, it says (sometimes). How Can Students Make Money? We started with – What, Why and How of Innovation and discussed Ideas and Innovation. We covered a variety of topics on why students should do startups, how to do innovation in colleges, how students can make money and a few other orthogonal topics. Ideas – There are no good or bad ideas. All ideas are good starting points. I talked a bit about the Value Pyramid where at the base are low skill, low income jobs moving up to higher income and requiring higher skills. We also talked a bit about Microproducts and Micropreneurship. I think different moderators used different formats for the unconference sessions and had different levels of interactivity. One disturbing comment was that many colleges have innovation cells (or equivalents) but they are dormant with literally no activity. Need to find out why. I enjoyed the session. One thing I would change next time around is to have the students pick themes instead of pre-defining them in the true spirit of unconference.